INTIMITÀ - In località San Donato in Poggio, vicino Tavernelle di Pesa, in provincia di Firenze, sorge il Ristorante Antica Trattoria La Toppa. Un ambiente intimo, cordiale ed accogliente, impreziosito da un arredamento rustico e caratteristico. LA CUCINA - Tutti i piatti proposti dal menù sono genuini e preparati con materie prime di qualità. Assolutamente da provare le pappardelle al cinghiale. cosy restaurant and good food. Worth the visit. Lovely outdoor setting, delicious food and engaging staff. Couldn't fault it. Very friendly staff and great typical Italian food! We had dinner on our last evening in this lovely restaurant in this beautiful medieval town. It was a stunning evening and a capstone to our first visit to Tuscany. Thank you to our hosts ! Service & food in this hidden village gem was excellent! Da non perdere le pappardelle. We visited on a Saturday night, the restaurant had no music or ambiance. When we sat down the waiter gave us a weird look because we didn't take any wine. We were both full of cold so the last thing I wanted was to drink. We only had a main course and a pasta. It was ok, overpriced and average at best. After our food I asked for the bill, then the owner sat down to our table. First he had a go with my wife, why she is on her phone instead of eating more food?!! We already asked for the bill !! After he said we didn't eat enough, finally he started to write up our bill, by sitting at our table asking what we had???! Strange they don't write down! It took about 5 min as he went through the whole menu asking what we didn't have, making a point we didn't eat enough. Finally he finished the bill, I gave him my credit card which he refused to take saying we didn't spend enough money to pay with card?? Eventually he took our card and we could pay our bill. He did change us 2 euros twice for bread which we didn't have also 10 percent service charge. He didn't thank at all when we payed. Over all very bad experience the place isn't genuine and really badly run. After we left we had a little walk around the town and we were realising how busy it was everywhere else it all made sense! I wouldn't recommend to go there! Low quality food, no atmosphere...and a criminal owner (the old one) who really pushs you to pay cash and becomes angry when you pay per card. You better book something else! As folks who only speak a little Italian well, we appreciated the service and that they let me botch their language as I tried to speak in Italian :) The view and food were AMAZING! Amazing pasta, really enjoyed Beef Stew. 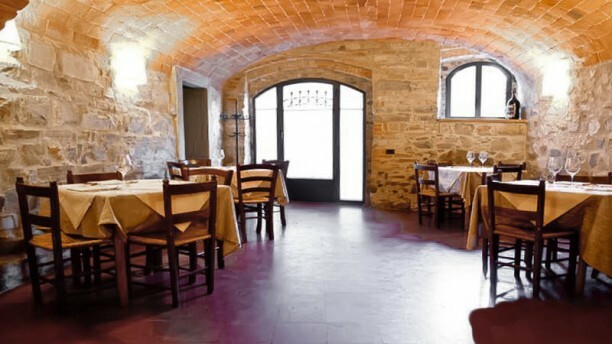 La toppa is a famous old cosy restaurant of San Donato in Poggio located in a very beautiful old street. the owner is very friendly and makes effort to make you feel good. the quality of the food is very good and the price are ok. This restaurant serves delicious pasta and reasonable mains and deserts but we left feeling that we had been ripped off. We made the mistake of ordering the waiter's recommendations without seeing a menu. We should have asked to see one. The bill, for this type of restaurant, was significantly larger than we expected. It included a service charge of 18 euro - 2 euro per person for our group of eight plus baby. Yes, they even charged service for the baby, despite the fact that the parents and baby left after the pasta course as the baby wouldn't settle. We were also charged 30 euro for 3 side dishes - a very ordinary salad, a plate of white beans and a plate of the spinach. Sides at a similar (very good) family restaurant a couple of days earlier were 4 euro per plate.